While giving her a bath, I asked my 2.5yr old if she thinks she can spell a few words with her bath letters. 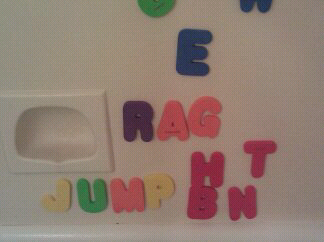 First we tried HAT, then RAG, then BUN , then JUMP. I would say the word then say the sound of each letter then she would find the correct letters from the pile and stick them on the wall (I'd say HAT- hah, aaa, tttt and she would understand what I meant). Since she only has one letter of each that she had to borrow the A and U from the previous words that's why BUN is missing the U and HAT is missing the A. Her motivation??? A cookie for each word she spells correctly. wow, baby doll, you're really so advanced! i hope cayden pays attention as much as you =D. well done, mommy berns!!! teach me naman o hahaha!